This article is about the UK garage group. For other uses, see Streets (disambiguation). In 2001, the Locked On label, which had success with The Artful Dodger featuring Craig David, released "Has It Come to This?" under the name The Streets. It was a breakthrough hit for The Streets, reaching number 18 on the UK charts in October 2001. For The Streets' first album, Original Pirate Material, Skinner wanted to take UK garage in a new direction with material reflecting the lifestyle of clubbers in Britain. The track "Let's Push Things Forward" reflects the philosophy of the album. The album was successful both with critics and the general public. In the UK, the album was nominated for the Mercury Prize and was favourite with the bookmakers to win (it was actually won by Ms. Dynamite). 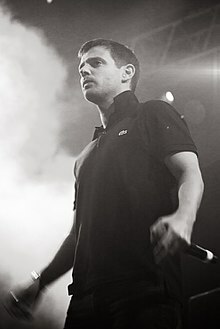 The Streets were nominated for best album, best urban act, best breakthrough artist and best British male artist in the 2002 BRIT Awards. The NME named it as one of their top five albums of 2002. The cover image is Towering Inferno by the acclaimed photographer Rut Blees Luxemburg. Subsequent singles from that album included "Don't Mug Yourself", "Weak Become Heroes" and "Let's Push Things Forward", which all reached the top forty in the UK. Many of his songs have a UK garage feel. Original Pirate Material had debuted and peaked at number twelve in the UK album charts, and did not reach any higher until his next album was released. The success of Original Pirate Material in the UK led to a US release of the album through Vice/Atlantic in late 2002. Though the album was not a commercial success in the States, it was received positively, with Rolling Stone, Spin, The New York Times, Blender, USA Today and the Los Angeles Times all nominating it as one of the albums of the year. The album was named Entertainment Weekly's "album of the year". The album reached number two on the Billboard electronic charts and the top 20 on the independent and Heatseeker charts in the US in 2003. In May 2004, Skinner released a new single, "Fit but You Know It" which became his debuting and highest single to that point, reaching number four in the UK. The single was later used by EA Sports as part of the soundtrack for its video game FIFA 2005. "Fit But You Know It" is from Skinner's second album, A Grand Don't Come for Free, which is a concept album about a short period in the protagonist's life. The events depicted include losing £1,000, the start of a new relationship, going on holiday, breaking up, and eventually finding the money again. The MC's remix of "Fit But You Know It" features formerly underground MCs such as Kano, Tinchy Stryder, Donae'o, Lady Sovereign and Devilman. The album entered the UK album charts at number two, but later reached number one. Soon after its release, Skinner's success grew in July 2004 with the second single, "Dry Your Eyes", debuting at the top of the chart in the UK. The success of this album and its singles led to a re-kindling of interest in the first album, Original Pirate Material, which re-entered the UK album charts and beat its original chart peak of two years earlier. "Blinded By the Lights", the third single from A Grand Don't Come for Free, entered the Top 10 in September 2004, and a fourth and final single, "Could Well Be In", was released in late 2004. Skinner's third studio album under The Streets' name, The Hardest Way to Make an Easy Living, was released on 10 April 2006 in the United Kingdom and on 25 April 2006 in North America. In the UK it entered the album chart at number one. It was a change in direction from his first two albums, the lyrical theme moving away from the stories about working class Britain and instead focusing on the ups and downs of the fame that Skinner encountered after the success of his previous albums. The first single, "When You Wasn't Famous", was released two weeks before the album. The song is about Skinner's troubles with trying to date a famous person, following his new-found fame. It was also named 'Track of the Week' by NME in early March 2006, but it only reached the bottom of the top 10, peaking at number eight. There has been much speculation over which celebrity "When You Wasn't Famous" is about - Rachel Stevens and Cheryl Cole are two names that have been ruled out, despite Skinner dedicating the song to Cole on Top of the Pops. This reluctance to reveal the subject may be more than simple politeness, as some of the descriptions of the unnamed starlet in the track are potentially damaging. At one point, Skinner discloses "my whole life I never thought I'd see a pop star smoke crack". Skinner disclosed in his memoirs that the track is not about his relationship with Rachel Stevens and that she was not the pop star who smoked crack. The second single, "Never Went to Church", is a tribute to Skinner's late father, and appears to use the chord progression of The Beatles' "Let It Be" as a backing. The album also included the track "Prangin' Out" which was later remixed with the Babyshambles frontman Pete Doherty. In September 2008, Skinner released his fourth studio album, Everything Is Borrowed. One song from the album was on Skinner's Myspace page for a while before being replaced by a cover of "Your Song". In a posting on his Myspace blog, Skinner noted that the group's upcoming LP would contain "peaceful, positive vibes" in comparison with 2006's The Hardest Way To Make An Easy Living. In a blurb about the album on Skinner's Myspace, he says, "This album started off life as parables but then I realised that it might get a bit cheesy so I got rid of the alien song and the devil song replaced them with more straight up songs. I've pretty much kept my promise that I made to myself not to reference modern life on any of them though which is hard to do and keep things personal at the same time." On 1 January 2009, the compilation album Original Bootleg Material was released. The album was a collection of B-sides, remixes and projects by Skinner. The album also included "Who Knows Who", featuring Muse, and works by artists who were signed by The Beats such as The Mitchell Brothers. In November 2010, Skinner announced on the official The Streets website, that he would release what he referred to as a "mixtape" album called Cyberspace and Reds, consisting of various recordings he had made since he had finished work on the final Streets album, Computers and Blues. Cyberspace and Reds was released in January 2011, initially only for download via the Streets iPhone app. A so-called "deluxe" edition was later made available for general download through the Streets website. The final Streets album, Computers and Blues, was released on 7 February 2011, the first single being "Going Through Hell". The band played live in 2011 at Jersey Live festival for the first time. Skinner performed at Reading Festival 2011, co-headlining the NME/Radio stage with 2manydj's. Skinner performed at the 2011 Freeze Festival at Battersea power station which was his final gig in London performing as The Streets. The Streets ended after their final show at The Big Reunion. On 22 December 2017, The Streets released two new tracks: "Burn Bridges" and "Sometimes I Hate My Friends More Than My Enemies" on streaming services. This marks the first new music release in six years. 2018 saw The Streets put out further singles: "If You Ever Need to Talk I'm Here" was released on streaming services on 31 January, "You Are Not the Voice in Your Head..." was released on 30 March, and "Call Me in the Morning" was released on 22 November. ^ "FIFA 2005 Soundtrack Announced". News.teamxbox.com. 10 August 2004. Archived from the original on 2 December 2013. Retrieved 28 February 2013. ^ "You're fitted up and don't you know it". The Sun. Archived from the original on 6 April 2006. Retrieved 30 September 2007. ^ "Streets life: stories from Mike Skinner about the Birmingham garage project". The Observer. Archived from the original on 25 March 2012. Retrieved 26 March 2012. ^ Simon Reynolds (2 June 2008). "The Streets to split after fifth album". Digitalspy.co.uk. Retrieved 28 February 2013. ^ Skinner, Mike (November 2010). "***cyberspace and reds***". Retrieved 5 February 2011. ^ Skinner, Mike (January 2011). "***cyberspace and red soup***". Retrieved 5 February 2011. ^ Skinner, Mike (January 2011). "***cyberspace and reds deluxe edition***". Retrieved 5 February 2011. ^ "The Fifth And Final Album From The Streets - Computers And Blues". Computers And Blues. Archived from the original on 30 May 2013. Retrieved 28 February 2013. ^ "The Streets Release First New Songs in 6 Years: Listen | Pitchfork". pitchfork.com. Retrieved 2017-12-25. ^ "Listen to the Streets' New Song "If You Ever Need To Talk I'm Here" | Pitchfork". pitchfork.com. Retrieved 2018-02-01. ^ "The Streets share new track 'You Are Not The Voice In Your Head'". DIY. Retrieved 29 October 2018. ^ Elizabeth Aubrey. "Mike Skinner returns as The Streets share new single: 'Call Me in the Morning'". NME. Retrieved 23 November 2018. Wikimedia Commons has media related to The Streets.